the more successful the study. CentraXX Trial – The planning and execution of studies are elementary components of clinical research. But often immense problems arise even in the project planning phase. Recruiting the critical number of patients with the criteria relevant for the study alone often turns out to be complicated and cumbersome. CentraXX Trial – the clinical trials module of the CentraXX product family – can help here. 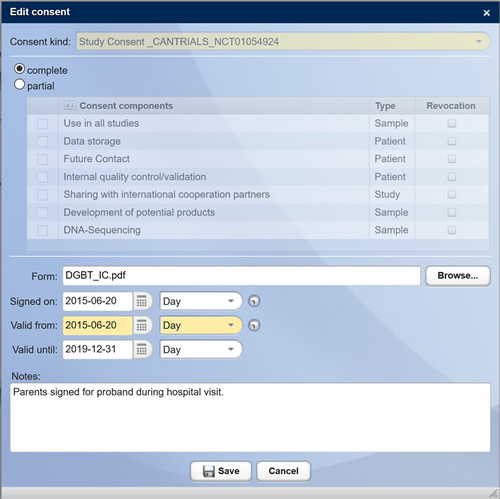 The main task and central component of the study management module CentraXX Trial is structured data collection and retention, which form the basis of study data storage, reporting and analysis. Here, too, the integrated workflow engine provides systematic process support for quality-assured study execution. CentraXX Trial is thus able to map all relevant scheduling and study design arrangements for population-based, care-related or clinical studies. A prerequisite for a campus-wide recruitment is the registration and clear presentation of all studies in a portal. In the study register, various study profiles, consisting of various documentation points with different characteristics and vocabulary, can be mapped. On the one hand, this allows sorting according to individual research fields and major, common diseases. On the other hand, the inclusion and exclusion criteria of all studies are recorded in a structured manner. Thus, the entire patient/subject pool with all its structured data (therapy, diagnoses, samples etc.) can be searched in CentraXX systematically for potential study participants. This mechanism facilitates feasibility studies, thereby minimizing the probability of low performers, resulting in cost reductions. After a successfully completed feasibility study, CentraXX provides automated recruitment proposals (e.g. from tumor boards) during the initial phase, taking into account all stored inclusion and exclusion criteria. CentraXX already actively supports the PI during the study design phase. With CentraXX, KAIROS bridges the gap between biobanking and study management and helps to combine the relevant data from both areas in a sensible and effective way. Awareness, consent and planning of therapies and operations are further important steps. These are then followed by the collection of biosamples, their storage and analysis as well as the documentation of all steps. Study reporting soon becomes extremely cumbersome. KAIROS bridges the gap between biobanking and study management and helps you to combine the relevant data from both areas sensibly and profitably. CentraXX Trial also maps the recruitment of patients (integration) and premature termination (fulfillment of termination conditions). With the help of these system tools CentraXX supports the execution of multi-center studies, integrated procedures and guarantees the greatest possible transparency at all times. The central storage unit for data is the patient-centered study file, which structures study protocols in the form of digital images and clearly assigns them to the subject. The CentraXX study record is an extended arm of KIS EPA used for research. The adaptation to new studies is done by using pre-designed and modifiable eCRFs. These electronic case report forms form the basis of the study documentation provided in each stage of the study. Study processes can be defined and visualized in advance as so-called swim lane models. The integrated workflow engine monitors, orchestrates and logs the process. Task lists, status flags and service entry make it possible to check the processing status of a particular patient at any time. Information on the biosamples taken, patient consents and other information render the study record a central compenent for documenting and exchanging information for test subjects. 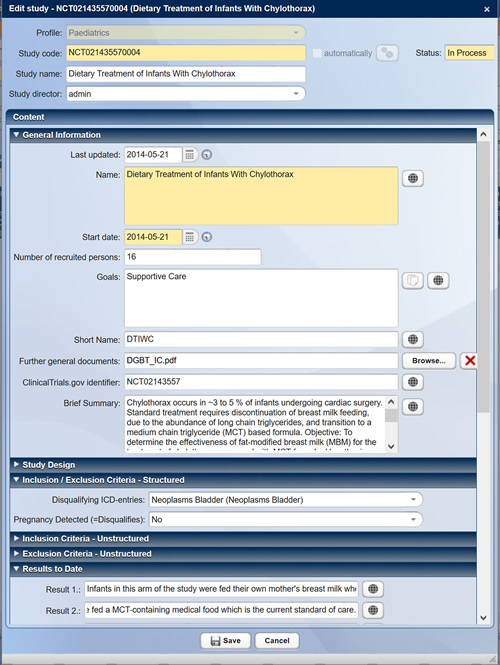 In addition to the respective study record as an information and function container, CentraXX Trial offers an integrated discussion forum. This “channel” can be used to organise tasks across roles and to exchange ideas that concerning the patients directly. The Study Forum offers activity lists for reference to study workflows, blog features for communication purposes and synchronized status information from the current study. The Study Forum is a valuable tool in view of the high demands on the quality of study management documentation. After all, new discoveries, from which new conclusions may be derived, must be documented and highlighted for the greater development of the study. In addition, it is not only the decision for a therapy and the result that are important in research, but also the previous deliberations, i.e. the considerations for diagnosis and the reasons that led to the choice of therapy. The integrated study forum goes beyond the examination of the reports and offers excellent opportunities to consider the deliberations of others involed in the studies. Ultimately, this feature implements the classic functions of a web forum. This has the advantage that one can write discussion contributions directly in reference to a study, a patient or an examination. This is of great importance for the cooperation of the research personnel. The contributions can be supplemented with keywords, blogs, topics or also with pictures, films, and links. Publication tools and tools for independent modelling complete the CentraXX study management, which can be divided into seven phases. CentraXX can already help you when you first define your studies. This makes it easy to determine the feasibility of a study by means of queries, searches and analyses. You can determine how many subjects have been enrolled in comparable studies in the past, or how the recruitment would have turned out in the past. This allows you to rule out “low performer” in the study definition. As soon as studies have been approved by the ethics committee or by your sponsor, you can add the corresponding documents to the study and have access to them for you and the selected project staff at any time and from anywhere. At this stage, you already have the option of storing the declarations of consent in the system in a structured manner. Using your own web-based administration tool, you can determine the study members and resources for your study without having to wait a long time and without any software experience. The study will be listed in the CentraXX study register so that all entitled persons have immediate access to important study information such as inclusion and exclusion criteria. A recruitment agent is available in CentraXX Trial. This means, among other things, that the anonymized admission data set is examined or, for example in oncology, that patients are displayed anonymously by the system as study participants at the time of the tumor board if they match the inclusion and exclusion criteria. In this way, you can draw the attending physician’s attention to a study and ask for recruitment support. In addition to documenting and monitoring the study, it is important to obtain managerial information at all times. If you want to query and analyze important key figures about all studies of your institution, the reporting tool of CentraXX helps you. Study results are not only presented in graphs and tables in the system, but can also be used to analyze studies with comparable results. This enables you to carry out benchmarking in the CentraXX system, which is important for further analysis. Finally, you want a very simple publication of your results. The CentraXX publication help functions similarly to the description of the medical reports from general hospitals. This tool allows you to select all important results and export them to a word processing or spreadsheet program. Detailed information on CentraXX Trial can be found on the Product Sheet.